Mobile app company Riffsy has announced it has raised $3.5 million in seed funding for its GIF Keyboard app on iOS devices. The funding round was led by Redpoint Ventures, and will help Riffsy transform the process of sending animated images to friends into one that’s as simple and “everyday” as sending emojis. To date, Riffsy has passed 500 million monthly GIF views. 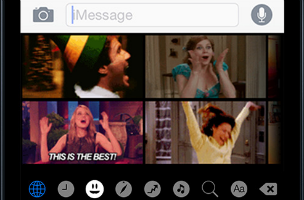 Riffy’s GIF Keyboard was launched on iOS in September 2014. Using the keyboard, users can text, iMessage, tweet and/or email millions of animated GIFs from their device. The app was downloaded more than one million times in its first three weeks. Each user opens the keyboard an average of nine times per day and shares five GIFs per day. There are millions of sessions each day across the entire Riffsy platform. After downloading the GIF Keyboard app, users must activate and allow full access to the keyboard via their device’s settings menu. From there, the keyboard categorizes GIFs based on theme, from happy and hungry to disgusted and tears. Users tap on a theme, browse to find a GIF they’d like to share (including many with audio), and then copy and paste the GIF into their text entry field to send it to a friend. In addition, users can pull GIFs from Safari and use them within the keyboard, and can create a collection of their favorite GIFs by double-tapping on images to favorite them. Riffsy’s GIF Keyboard is available to download for free on the iTunes App Store. Riffsy was founded in 2014, and is also backed by Initial Capital and John Riccitiello.